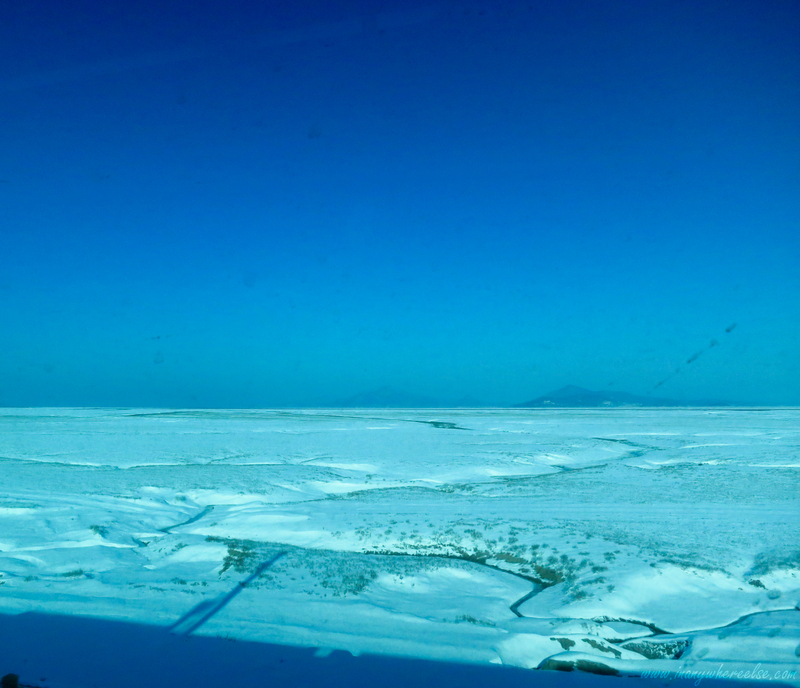 as the plane was about to make its descent towards incheon airport, i was already gushing inside after seeing the vastness of a snowy terrain thousands of feet below. i turned a full face to the window so that i could hide my obvious excitement away from a nonchalant seatmate. i might not realize it but i could have been wearing a huge smile already! it was definitely a one-of-a-kind moment for me because finally in my life, i was about to experience winter! 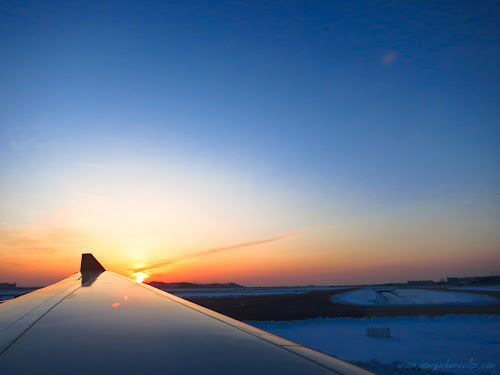 and when the plane landed, the early morning sun stirred me from my deep musing and i found myself waking up from a distant dream into an actual reality! i could cartwheel that instant! and the sunrise photo above never fails to remind me of the outpouring emotions on that winter day. sorry for the melodramatic introduction but circumstances kind of call for it. back to the main topic. 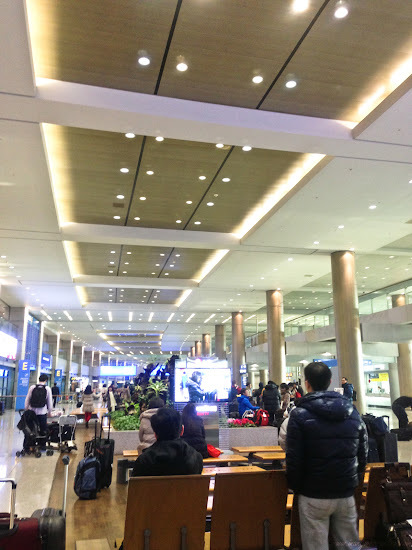 so, how did i get my dreamy self to seoul from incheon airport? and would you mind minimizing the map? i seriously have no idea how to set it by default. if you're like me who's a visual person, maps will always be a way to go. high five! as you can see in the map, incheon airport is quite far from seoul and in fact, incheon is a different city. it's not even part of seoul at all. 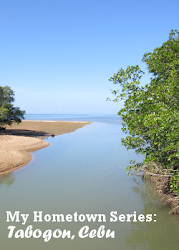 well, during my planning phase, i was choosing between an airport bus or the train. airport bus is more expensive but i wouldn't worry myself with transfers especially that i have a luggage in tow. there was even an airport bus stop which was a walking distance to my hostel. it was just perfect! however, after some thought at the arrival hall, i decided to take the train instead. it didn't ensue a debate with myself even if a man offered a taxi service to me. a taxi option is superfluous! anyway, i bought my T-money card from GS25 (a convenience store) located at the arrival hall and i had it loaded with ￦20,000. the T-money card is south korea's version of transportation card which works on buses and trains but more than that, you can also use it as payment for some stores. getting to the train platform was a considerable walk from the arrival hall that i needed to go down through an escalator and after several turns with sufficient signs all over, i finally reached the train ticket gates. i was only taking the commuter train since i would make a transfer at gimpo airport for line 5. take note that aside from a commuter train which stops at every train station along its way, there is an express train which goes non-stop from incheon airport to seoul station, albeit with a more expensive fare. this is only a snapshot of the extensive train system in south korea with incheon airport and the center of seoul as main references. i believe that with the existence of trains, you will never be lost even in an entirely new place. figuring out the correct exit in train stations is of course, a different matter. i downloaded this train map app into my phone which was my helpful companion the entire time i was in south korea. what makes it even cooler is that, it doesn't require data! you know, how data roaming could be a total nightmare! my hostel is located at yeongdeungpo-gu. it is a 10-minute walk from yeongdeungpo market station in the midst of a quiet neighboorhood. the location is a bit far off from the center where many tourists attractions are just a couple of stations away but i really didn't have a problem with it because of the convenience of trains. here was my route from the airport to my hostel. refer to the map above for a visual treat. it took me 1.5 hours, including waiting time and the walk to reach my hostel. the estimated time by the app is a little optimistic. maybe, it doesn't consider the distance involved during train transfers. 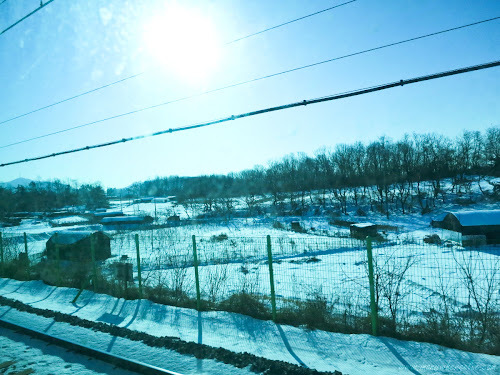 while i was on the AREX train, i busied myself by taking photos on the surrounding snow landscape. the train was not crowded so, i was able to stand up from time to time. i didn't care if i looked quite the naive to everyone. haha! i only sat still when i transferred to line 5 which is already a subway train. i enjoyed the train ride and the transfer was not a biggie because i only had to drag my wheeled luggage. at gimpo international airport, there are elevators that can bring you and your luggage down to platform level. 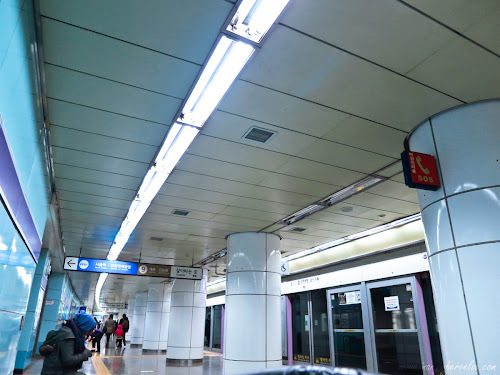 but when i got to yeongdeungpo market station, it wasn't exactly the same case. yes, there was an elevator that could bring me up to 4 levels which was one level less from the ground. but i was put in a slightly awkward situation because only grandmas and grandpas were using the elevator! i had to shrug off the feeling of being out of place because i couldn't imagine hauling my luggage while climbing an endless flight of stairs. after that predicament, i had to breathe a sigh of relief when i successfully hoisted my luggage out into an open but very cold air! oh, this was what they call winter then. as comparison, the airport bus 6008 to yeongdeungpo market station would have cost me ￦9,000. it was really a good deal on my first day. well honestly, part of the reason that i was hesitant to take the bus was my lack of confidence on which stop i should get off. i might have familiarized myself with my hostel's area many times by using the street view of google map and i even had my landmarks. but the probability of getting lost was there and it would be downright tragic while dragging my luggage on a freezing day! if you're interested with the express train, it costs ￦8,000 and travel time takes 43 minutes according to incheon airport's website.